Eight questions in this week’s mailbag. It was nine before Sonny Gray got sent to the bullpen, but now it’s eight. Send your questions to RABmailbag (at) gmail (dot) com. Mike asks: Thoughts on Phil Nevin ripping the team a new one yesterday? After the game Nevin said it wasn’t directed at any one player, but the team in general. “There’s no disrespect to anybody across the field or anything like that, but I think anybody you ask, we were better than what he showed today and that was it. Some people just have different ways of firing guys up,” he said to Owen O’Brien. Anyway, the Yankees deserved it because their play was terrible. Sloppy, lazy, lethargic. Coaches yelling and team meetings and all that stuff is generally very overrated — especially team meetings, my goodness — but they do need to happen once in a while, and Nevin gave the players what they deserved. No problem with it at all. 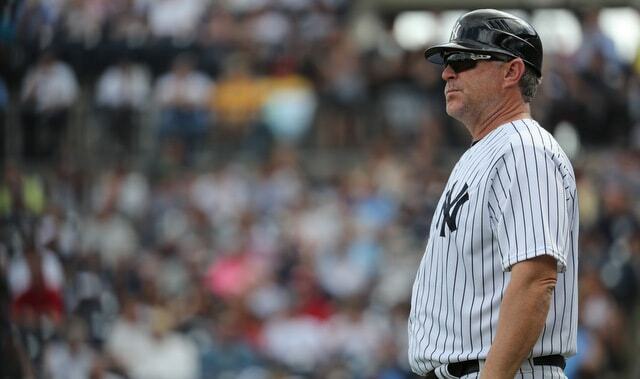 The Yankees played like crap, it was unacceptable, and they needed to hear it. Too bad the message doesn’t seem to have stuck. Vincent asks: Your thoughts on the Yankees potentially calling up fewer players in September than normal to not add money to the payroll? You know what? It might happen. The Yankees are usually very aggressive with September call-ups. They called up five players on September 1st last year and eleven players in September total. They called up seven players on September 1st the year before. They called up nine players on September 1st the year before that. The Yankees call up so many players in September and a few of them basically never play. Caleb Smith threw one inning last September. Tyler Austin got seven plate appearances. By my unofficial numbers, the Yankees have about $3.3M still to spend this season, which is plenty for a full complement of September call-ups. Call up the maximum 15 players on September 1st and it’s $1.45M against the luxury tax if they’re all making $600,000 annually, which they’re not. The league minimum is $545,000 this year. This shouldn’t be a problem. The Yankees usually finish the year with something like 37 or 38 players on the active roster and I think that’ll be the case this year. But, if they make a trade in August, maybe they will have to cut back on September call-ups to make it work financially. That guy who gets called up and never plays might not get called up this year. Dan asks: Seems like the Yankees don’t get 6 innings out of their starters very often and the only guy that can do it consistently is Severino (when he’s not in a slump). I wonder where the Yanks rank in IP by starters among the league and especially among contenders. Do you think the Yankees should not only look to acquire a top of the rotation starter for next season (or prior to the deadline if possible) but also a starter that’s able to eat innings? Going into yesterday’s gamee the Yankees had received 6+ innings from a starter 48 times this season. That is 20th most in baseball, tied with the Braves and Royals. Among contenders, only the Cubs (44) and Brewers (41) have fewer. The Yankees are 24th in baseball with 571 innings from their starters. That is the fewest among contenders, just below the Dodgers (584.1), Cubs (573), and Braves (572). Part of that is the bullpen — why push the starter for extra outs with this bullpen? — but yeah, the Yankees don’t get many innings from their starters. Everything in baseball is trending toward using pitchers less and less, though an innings eater would be cool. Asking the bullpen to get 12 or so outs a game is trouble. That said, the focus should be on quality innings, not quantity. How often will the starter going through the lineup a third time be a better option than a fresh reliever? Especially with the Yankees’ bullpen? In close games, the fresh reliever is almost always the best option. When a Yankees’ starter goes deep, it’s usually in a game the Yankees lead by a few runs. Quality and quantity is great, but prioritize quality. Bubba asks: I was wondering. When the Yankees trade for international bonus money, is actual money traded, or the right to spend said amount? Seems like $1.5M is an awful lot to pay for Caleb Frare. I’m pretty sure you only acquire the right to spend money. I’m not certain about this, but I do think that’s the case. Otherwise I don’t think there’s any chance a team would trade $1.5M in cash for a guy like Frare. The Yankees got $1.75M total for Yefry Ramirez and Matt Wotherspoon last year. I can’t see a team spending that much in real money to get those two guys. My guess is that, if teams had to trade actual money rather than the right to spend money, we wouldn’t see nearly as many trades. Or, rather, the international bonus money would come at a much higher price. No one’s taking $1.5M out of their annual budget for a dude like Frare. How silly was the Shawn Kelley stuff earlier this week? 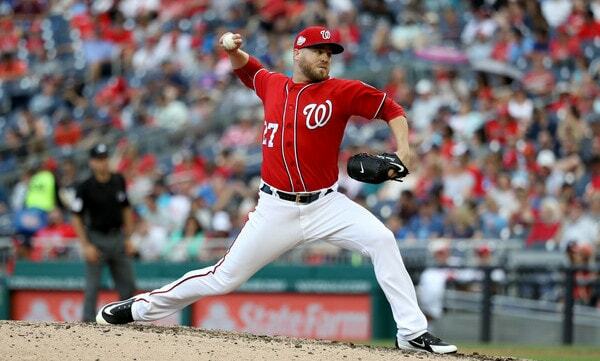 In case you missed it, Kelley gave up a home run in a blowout win, slammed his glove on the mound, and the Nationals designated him for assignment because it was “disrespectful” and “selfish.” If Kelley had been healthy and pitching well, it would’ve been called “competitive fire.” But, because he’s been hurt and mostly ineffective the last two years, it’s “disrespectful.” Old school baseball pearl-clutching at its finest. Anyway, my guess is the Nationals will trade Kelley to a contender for a fringe prospect. Either the Dodgers, Red Sox, or Athletics is my guess. Kelley has a 3.34 ERA (4.55 FIP) in 32.1 innings around a trap injury and he’s been very home run prone. Seven homers in 32.1 innings this year and 19 homers in 58.1 innings the last two years (2.9 HR/9). I’m not sure what the Yankees could do with him. Drop A.J. Cole for Kelley? No. Send down Jonathan Holder? As bad as last night was, I don’t like it. I don’t see the Yankees putting Sonny Gray on the phantom disabled list. Not sure there’s a fit here. Alexis asks: I want the Yankees to extend Didi but if the Yankees don’t extent Didi this offseason, what should they do with him? Trade Didi for prospects and sign Machado to play SS or move Torres to SS and sign a new 2B? Why not just keep Didi Gregorius for 2019? I am not particularly interested in playing Manny Machado at shortstop full-time. I’ve been kinda shocked at how bad he’s looked there this season. Maybe he’ll get better with time, but he’s already had surgery on both knees, and I’m not sure how much mobility he’ll regain. It seems like every time a ball is hit to Machado at short, he’s playing it from his knees or a dive. He’s always on the ground. I’d sign Machado for third base only. The Yankees could absolutely put Gleyber Torres at shortstop long-term, either after they trade Gregorius or he leaves as a free agent. I bet Torres would be a better shortstop than second baseman, defensively. It’s his natural position. He’s been playing it his entire life. Gleyber has played only 112 career games at second base. Not even a full season yet. His inexperience shows at times. Put him back at short and I think he’d look real natural there real quick. I say keep Gregorius for 2019 then see where you stand when he becomes a free agent after the season. Moving Torres over is the early leader in the clubhouse for post-Didi shortstop, which means the Yankees would then have to find a second basemen. Andrew asks: Can u explain how the minor league options work it seems some guys go up and down 10 times a season and then they say another player is out of options. They are minor league option years. Players use one option per season and they can go up and down as many times as the team wants in an individual season. Each player gets three options so they can go up and down in three different seasons. One option per season, three options total. Well, some players qualify for a fourth option under certain conditions, but it’s uncommon. Once a player uses up his three option years, he has to pass through waivers to go to the minors. James asks: Does post-season pay count toward the luxury tax? Depends. If we’re talking about the postseason pool money that comes from MLB, no, that doesn’t count against the luxury tax payroll. Last year the Yankees were given a $10,140,051.86 pool to split. It’s a big chunk of change. Imagine dumping that on a team’s luxury tax payroll at the end of the season?